In this section, you will learn about jazz guitar playing and in particular learn some useful chords and common chord progressions. Open chords are seldom used in jazz, neither is triads. Among the most used chords are extended chords (i.e. 7th, 9th, 11th, 13th), which are played in movable shapes with various voicings. The four shapes below are movable and can be used for all notes. The first two have the bass note on the sixth string and the other two on the fifth string. More chords will follow further down the page. * It is also common to use a standard barre chord (often with the highest string omitted) for the m7 chord with bass note on the fifth string. Are you unsure how to play a specific chord? If you play the "maj7 shape 1" with the bass note on third fret it would be a Gmaj7. And if you play the "maj7 shape 2" with the bass note on third fret it would be a Cmaj7. See notes on the fretboard. The second m7 shape has only three notes, but you could add a fourth by playing it as X2X232. Basslines are common in jazz and here are two playing examples (illustrated in tabs) that show you how this can be done in an uncomplicated way. The first example uses the chord shapes above with bass notes on the sixth string. The second example use the chord shapes above with bass notes on the fifth string. It is not necessary to play exactly as in the tabs, the most important is that you apply the chords and the basslines concept in some way. Here are some common jazz progressions in jazz. This means that you can use the same chord formula in all keys. The roman numerals tell which note it is in the scale. Small numbers indicate minor; otherwise, it is major. In both these cases the first chord in the progression is not the I chord, which is typical for jazz progressions. The first progression is in the key of C and the second in the key of A. See a larger collection of jazz progressions. Chord substitutions are very common in jazz and means that a chord change to another with the same root, for example Cmaj7 shifting to Cmaj9 or D7 shifting to D13. The chord progression Cmaj7 - Am7 - Dm7 - G7 could sound slightly different with some substitutions. One way could be Cmaj7 - Am9 - Dm11 - G13. Then playing jazz on guitar it will often sound better to play on 3 to 5 strings instead of 5 or 6. Therefore, the regular barre chords isn't especially suited. The movable chords in pictures below brings a jazzier sound than other typical chord versions. The shapes could be difficult depending on your ability to reach over the fretboard, of that reason simplified chords are presented as well, which by the way can sound equally good or even better in many situations. First, we will look on two ways (including simplified versions) to play the seventh chord with the bass note on the sixth and fifth string respectively. Here are two ways (including simplified versions) to play minor seventh chords with the bass note on the sixth and fifth string respectively. Both dominant ninths and minor ninths are pretty common in jazz. Here are suggestions for chords shapes to use. Also common is eleventh and thirteenth chords. Here are suggestions of shapes. You could also play a 12 bar blues with the shapes above and include G7, C9 and D9. See more playing examples of 12 bar jazz-blues. If you're used to play open chords, some of these can be useful in a jazz context after all. Even if they are not the most viable chords in guitar jazz music you could practice the standard major seventh and minor seventh chords in open positions. Both categories create another color to the sound than the usual major and minor chords. If want to improvise jazz a great way is to play scales over chords (see the article "The relationship between chords and scales"). It is great if you could play together with someone else, otherwise, you could play over backing tracks. If we return to the common Dm7 – G7 – Cmaj7 progression, you could play three different scales over it. There are many possibilities and one way would be: D Dorian over Dm7, G minor blues pentatonic over G7 and C Lydian over Cmaj. 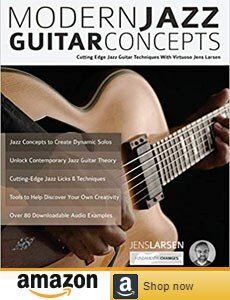 More in-depth readings could be found in Jazz Guitar Chord Mastery: A Practical, Musical Guide to All Chord Structures, Voicings and Inversions. You won't have any problems finding compilation albums with these artists.